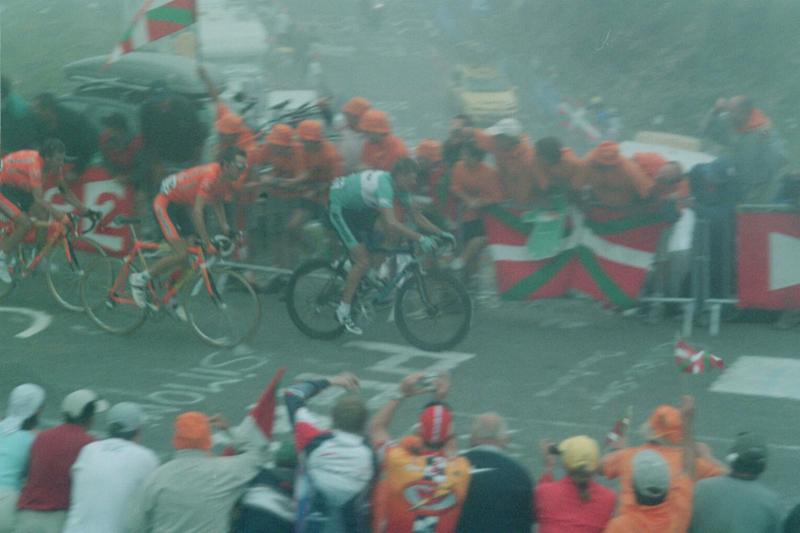 In 2003 I visited France for 3 weeks and followed the Tour de France through the Alpes and Pyrenees. On a warm morning in July I rode from Lourdes up the east side of the Col du Tourmalet, descended the west side and continued the climb up to Luz Ardiden for the finish of Stage 15. As is typical with many Tour de France mountain top finishes, the road was packed with fans that day and the last three or four kilometers to the top was closed to cyclists. We dismounted and carried our bikes along the edge of the road for a few kilometers, then found a spot on the hillside to rest our bikes and our bodies. We waited. It was a long cold foggy wait that day on Luz Ardiden. But it was a wait well worth our time. We could see a large screen TV near the finish line and hear the French Tour commentator from where we stood on the hill. The fog periodically blanketed and revealed the screen above us as we stood surrounded in the excitement of the fans anticipating a pack of riders approaching from the switchbacks below. At the very moment the large screen again became shrouded by a cloud, the commentator gasped, and then gasped again, quickly sputtered some words in French, and then in full voice burst forth, "Lance ArmstroNG!, Lance ArmstroNG!, Lance ArmstroNG!". What was happening? Had he fallen? 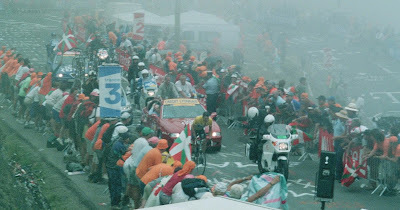 The buzz in the crowd began to spread that Armstrong had fallen just down the road. We waited, the screen remained clouded over. Suddenly with a crazed angry pedal stroke and a look I will never forget, Armstrong emerged in front of us, the lone rider. Distanced from the other riders, he flew past us headed to the summit 500 meters away. Followed quickly by Ullrich, Mayo, and Zubeldia. I can still remember the unexpected look of pursuit on their faces. 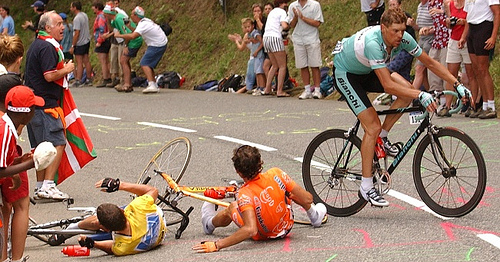 It was later that night that we learned what had happened that day on Luz Ardiden; when a mussette bag had snagged Armstrong's handlebars and brought him to the ground, only to rise again in a panicked fury. I was there that day on Luz Ardiden and will never forget the competitive look of an athlete turned inside out with the raw realization of "I cannot loose".